I was pleased and proud at the Battle of Kent yesterday to award Kelly Chubb with her 4th Dan Black belt which is very well deserved after 17 years of continual training and contribution not only to the TKO Elite Gym but also the sport of Kickboxing in general. Kelly has continued to train with me for all that period, during which time she undertook a very successful competitive fight career winning titles including the IKF 5 nations, WKA Commonwealth and taking first place at the IKF World Classic. She sets the very best of examples for all our members to follow. She has continued to develop and widen her knowledge and skillset and is now a senior Instructor with the TKO Elite gym and also an official for the IKF and the mainstay of the officiating team at the Battle of Kent events. 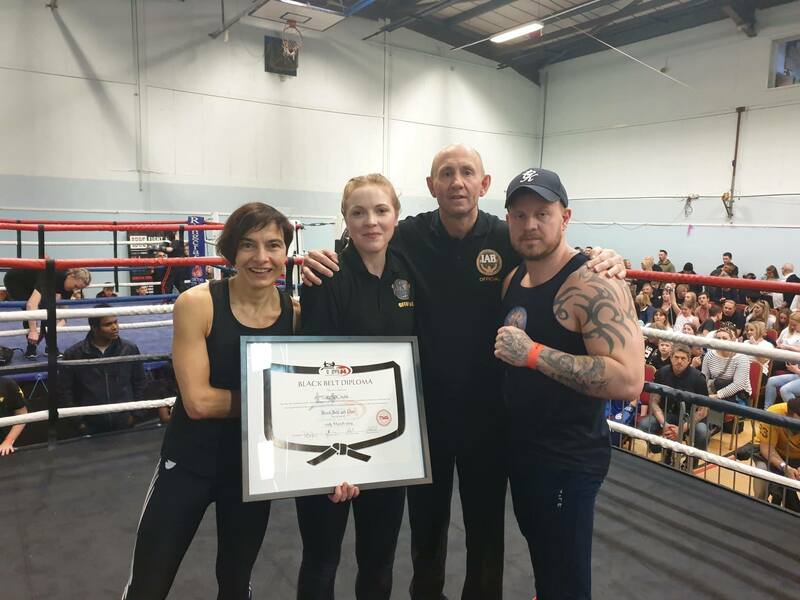 Her certificate was also signed by Pete Foley 8th Dan, Leigh and Paul Haworth, both 4th dans and was presented to her at my request by Tiffany Williams from KICKS, one of the most respected fighter/coaches on the circuit and a very appropriate choice I felt to make the award. Kelly will be back in the gym from tonight making all the members of her class work extremely hard I’m sure, so be sure to congratulate her on her achievement.